This running shoe and smartphone app combo hopes to become your virtual running coach. A traditional fitness tracker will keep track of all sorts of things—how many steps you've taken in a given day, how far you've walked or ran, your heart rate, and so on. With the Altra IQ, Altra Running and iFit want to go beyond general fitness metrics and provide more specific information to runners. The Altra IQ is a pair of Bluetooth-equipped running shoes with sensors embedded in the soles to track all sorts of metrics specific to running. The Altra IQ will keep tabs on your running distance, pace, time, and splits, but that's not all. 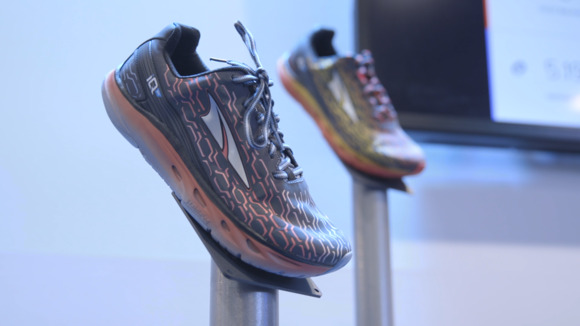 These "smart shoes" will also track your running cadence, how long your foot touches the ground on each stride, whether you favor one foot over the other, and which part of your foot hits the ground as you step. A companion smartphone app analyzes the sensor data and provides feedback and suggestions along the way to help you become a better runner. It'll give you this feedback in real-time, too, so you can make adjustments during your run. The sensors can hold up to rain and puddles, according to Altra IQ's makers, and are powered by a lightweight battery pack powered by commonly available "coin" batteries. Also, you don't have to bring your phone with you to record your data: The shoes will store the information they collected until you're ready for it. The Altra IQ shoes will be available this spring through Altra's website and select retailers, and cost around $200.